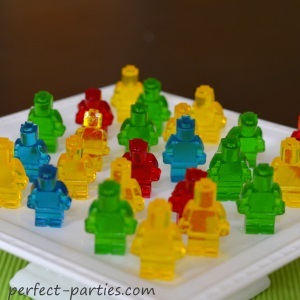 Cute Lego Bricks and Lego Men made out of Jello in this special technique to make them into gummy candies. 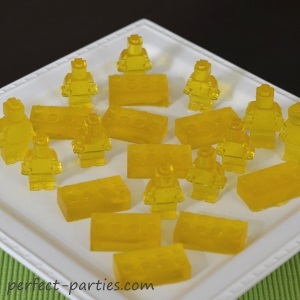 Cute for any lego themed party. Note the serving size at the bottom of the page for reference. 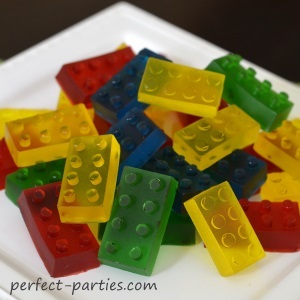 For future reference, print our Lego Gummies Recipe.. Plastic dispensing bottles (recommended). We found these at Walmart for a $1 each. Mix until fully dissolved before turning on the heat. Put half cup cold water into a small bowl or in a measuring cup. 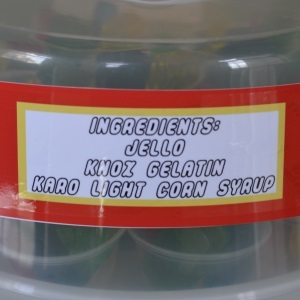 Add two packages of Knox Gelatin and the package of Jello. Mix until completely dissolved. If you do not, you may get "cloudy" gummies. Turn on heat to med low and stir frequently for about 6-8 min. Set your timer from the moment you turn on the stove. 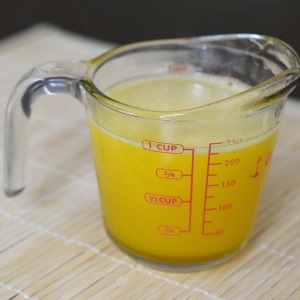 Pour into the measuring cup and let cool 5-10 minutes and skim the top with a spatula and discard. 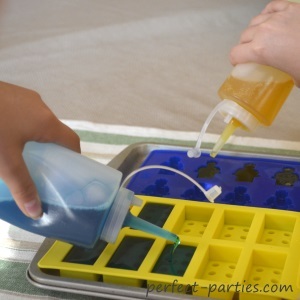 Pour into a dispenser bottle for easiest way to fill the molds. Slowly pour into each of the molds until it completely fills each cavity. Let cool in refrigerator for about 6 hours and then pop out of mold and store in container. Refrigerate to keep fresh. Pour carefully into your molds with dispenser bottles. 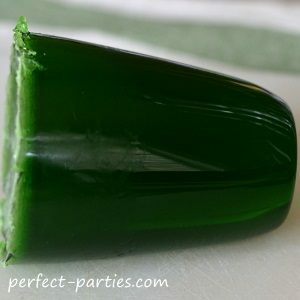 If you are doing more than one color or a larger batch, pour the extra jello mixture into a wide mouthed glass where you can easily put your hand into it. I found a 2 cup measuring cup much easier to remove the hardened jello. When it hardens, it takes a little bit of "peeling" from the sides of the glass to remove. I found using a butter knife to slide carefully around the sides was easier than trying to remove it by hand. Remelt on low heat in a pot and stir till completely dissolved. Pour into molds. 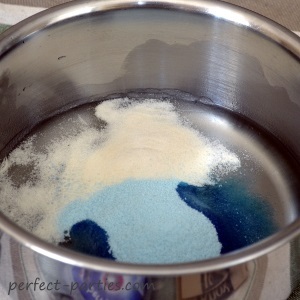 This method works well if you just have a couple molds or want lots of different colors. 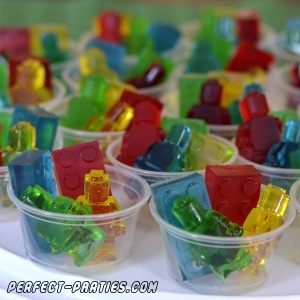 Just to give an idea, one box makes one cup of candy syrup and filled approximately two lego brand molds. 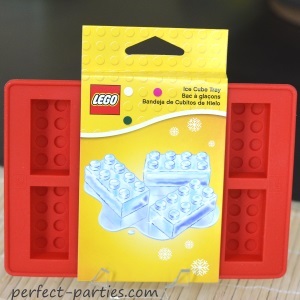 Note that other brand molds may have larger bricks and lego men and will take more syrup. One box will make the amount of jello pieces shown on the far right. 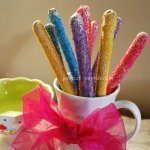 So if it's for a party, you need to make several servings of each color and I'd start a few days to a week ahead! Just keep refrigerated after making. We did 12 boxes of jello, 4 different colors. Refrigerate molds and extra solution. 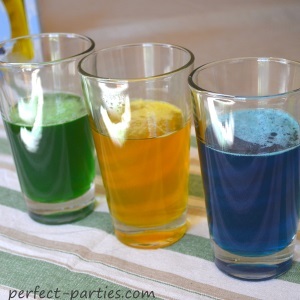 After it hardens, remove pieces from mold and extra jello mixture from the cups and store in refrigerator. We put the jello from the cups in a large ziplock. Repeat with second color, pour in molds and again place the excess in the cups. 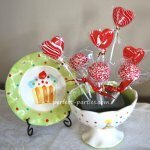 We did this for all the colors and then took the hardened jello mixture from the cups, remelted and poured into the molds. 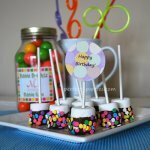 We separated the colors with parchment paper, bought portion cups and filled and made some fun labels with lego colors. 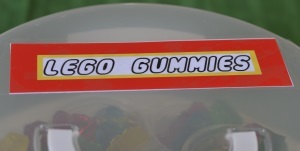 If you would like to print the labels we made, here they are Lego Gummy Labels. We recommend glossy photo paper for best results. You could use any silicone mold or jello mold. 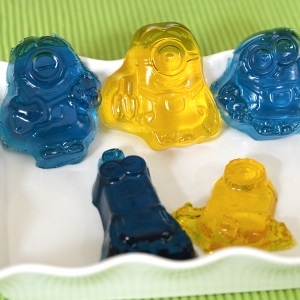 We tried Minion Jello Molds too. One cup makes only a few because of the size of each minion but they were cute as well. We learned the the texture of the silicone mold determines whether the jello pieces are clear or slightly opaque. If the mold is shiny, it will be clear. The lego bricks had a smooth surface which made the jello slightly opaque...not quite as clear but still pretty.